Are you wanting to finally remodel that kitchen, getting rid of those 70s style cabinets? Or are you simple ready to start the new year with a new kitchen to better fit your new life or lifestyle? Or is the kitchen remodel part of a whole house overhaul? What do you want your kitchen to do for you? Do you want a kitchen that will more fully suit your culinary skills? If so you will need to base your kitchen remodeling priorities around this vision. Do you wish to entertain guests or turn your home into a party pad? If these are your priorities, how you remodel and what you remodel may be different from the aspiring chef’s priorities. When you are considering what you need from your kitchen and the lifestyle that your kitchen serves, be realistic about your lifestyle. What is the kitchen triangle? The kitchen triangle is the path that you take from the fridge to the sink, to the stove, and back. Is your current orientation efficient? Or are you constantly frustrated by having to carry items all over your kitchen before you can use them? One popular way to solve the kitchen triangle problem is to install an island. Many move their sink to the island for better, more efficient workplace and flow, as well as to free up some counter space. Along with solving or considering the kitchen triangle, you must consider the overall layout of the kitchen. Knowing the purpose of your kitchen and the lifestyle that you wish your kitchen to cater to is important for this reason: Your layout may change due to what you need. Do you want more space for a dining area, or would you rather get rid of space taken up by an extra dining area for more kitchen space? Another fun, but sometimes expensive part of a kitchen remodel is an appliance upgrade. Remodeling your kitchen is a perfect opportunity to upgrade, because you aren’t bound as much by space restrictions: In many cases, if you want a bigger fridge, you can get a bigger fridge! If you want a longer stove top or bigger oven, you can most likely do that. Be sure to consult your local electrician if you are considering major appliance upgrades, to make sure your electrical system can support the new addition. Another big part to consider during a kitchen remodel is organization. We all have been there: We organized the kitchen once, yet to reorganize it again, and for many, still not sure how to store all those Tupperware lids. Organization can be incredibly frustrating, but it doesn’t have to be, especially when you are thinking about a kitchen remodel. Many organization companies make products to solve these seemingly age-old and haunting organizational problems. With that being said, when you are thinking about your kitchen remodel, consider if you would like more organizational space or if you need to organize your kitchen differently and so need to alter the layout of cabinets. Organization is a huge part of making a kitchen useable and enjoyable: Be sure to spend considerable time thinking about your needs! Kitchen remodels are overall an exciting venture and they can be even more exciting when you have the opportunity to save money. Save money? Though you will have to invest in the cost of a remodel and all that it entails, when your aim is to make your kitchen more energy efficient, you will be investing in the future state of your bank account. Energy-efficiency, if this is one of the goals of your kitchen remodel, it should be considered in almost every aspect of your remodel: Appliance upgrade, lighting, and the how the layout of your kitchen affects your use of natural light. Lighting can be one of the most fun parts of a kitchen remodel, because it is an easy way to change the style and look of your kitchen. Lighting can also be a great way to improve the functionality of your kitchen and as mentioned previously, its energy efficiency. With this in mind, consider if you would like more natural light. Also, if you are changing up the layout of your kitchen, will you need to change your lighting fixtures and where those fixture are situated? Lighting is an easy way to modernize a kitchen still sporting decades-old stylings. 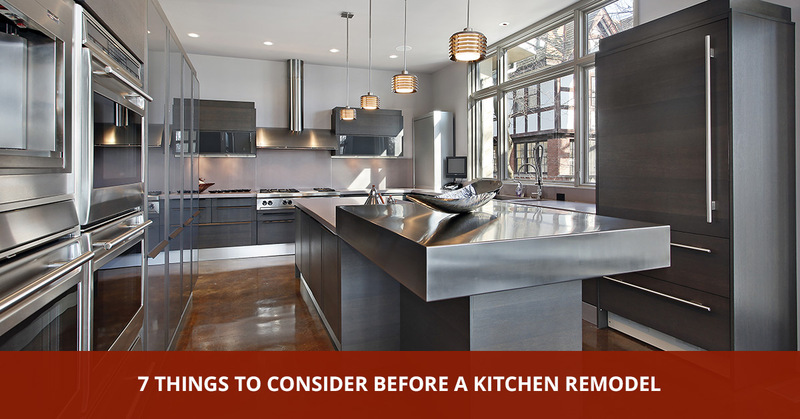 Are you getting ready for a kitchen remodel? Call your local electrician! As mentioned previously, depending on your remodel you may need to call an electrician whether you are completely changing the layout of your kitchen, or you are upgrading your appliances. In many cases, having your electrical work inspected as you are remodeling can be beneficial: If any of it needs replacing, replacing it while you have your kitchen torn up is so much better than having to redo your remodel simply because your electrical system is out of date. Call your local electrician at Front Range Electric! We serve the Colorado Springs area with our Top Rated Local® services. Planning a remodel? Contact us for a Free Consultation!